Not to be confused with Battle of Cambrai (1917). In the aftermath of the First Italian War, Pope Alexander VI had, with French assistance, moved to consolidate Papal control over central Italy by seizing the Romagna. Cesare Borgia, acting as Gonfalonier of the Papal armies, had expelled the Bentivoglio family from Bologna, which they had ruled as a fief, and was well on his way towards establishing a permanent Borgia state in the region when Alexander died on 18 August 1503. Although Cesare managed to seize the remnants of the Papal treasury for his own use, he was unable to secure Rome itself, as French and Spanish armies converged on the city in an attempt to influence the Papal conclave; the election of Pius III (who soon died, to be replaced by Julius II) stripped Cesare of his titles and relegated him to commanding a company of men-at-arms. Sensing Cesare's weakness, the dispossessed lords of the Romagna offered to submit to the Republic of Venice in exchange for aid in regaining their dominions; the Venetian Senate accepted and had taken possession of Rimini, Faenza and a number of other cities by the end of 1503. 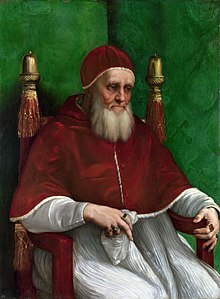 Julius II, having secured his own control of the Papal armies by arresting and imprisoning Cesare, first in Rome and later in Madrid, quickly moved to re-establish Papal control over the Romagna by demanding that Venice return the cities she had seized. The Republic of Venice, although willing to acknowledge Papal sovereignty over these port cities along the Adriatic coast and willing to pay Julius II an annual tribute, refused to surrender the cities themselves. In response, Julius concluded an alliance with France and the Holy Roman Empire against Venice; the death of Isabella I of Castile and the resulting collapse of relations between the parties soon dissolved the alliance, but not before Venice had been induced to abandon several of the cities. Julius, although unsatisfied with his gains, did not himself possess sufficient forces to fight the Republic; for the next two years he instead occupied himself with the reconquest of Bologna and Perugia, which, located between Papal and Venetian territory, had in the meantime assumed a status of quasi-independence. In 1507, Julius returned to the question of the cities in Venetian hands; once again rebuffed by the Senate, he encouraged Emperor Maximilian I to attack the Republic. 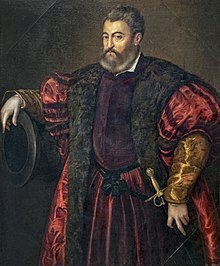 Maximilian, using his journey to Rome for the Imperial coronation as a pretext, entered Venetian territory with a large army in February 1508 and advanced on Vicenza, but was defeated by a Venetian army under Bartolomeo d'Alviano. A second assault by a Tyrolean force several weeks later was an even greater failure; Alviano not only routed the Imperial army but also seized Trieste and Fiume, forcing Maximilian to conclude a truce with Venice. Julius, humiliated by the failure of the Imperial invasion, turned to Louis XII of France (who, having been left in possession of Milan after the Second Italian War, was interested in further expansion into Italy) with an offer of alliance. In mid-March, the Republic provided a pretext for an attack on itself by appointing her own candidate to the vacant bishopric of Vicenza (an act in keeping with prevailing custom, though Julius considered it a personal provocation); the Pope called for all Christian nations to join him in an expedition to subdue Venice. On 10 December 1508, representatives of the Papacy, France, the Holy Roman Empire and Ferdinand I of Spain concluded the League of Cambrai against the Republic. The agreement provided for the complete dismemberment of Venice's territory in Italy and for its partition among the signatories: Maximilian, in addition to regaining Istria, would receive Verona, Vicenza, Padua and the Friuli; France would annex Brescia, Crema, Bergamo and Cremona to its Milanese possessions; Ferdinand would seize Otranto; and the remainder, including Rimini and Ravenna, would be added to the Papal States. On 15 April 1509, Louis left Milan at the head of a French army and moved rapidly into Venetian territory. To oppose him, Venice had hired a condottiere army under the command of the Orsini cousins – Bartolomeo d'Alviano and Niccolò di Pitigliano – but had failed to account for their disagreement on how best to stop the French advance. Consequently, when Louis crossed the Adda River in early May and Alviano advanced to meet him, Pitigliano, believing it best to avoid a pitched battle, moved away to the south. On 14 May, Alviano confronted the French at the Battle of Agnadello; outnumbered, he sent requests for reinforcements to his cousin, who replied with orders to break off the battle and continued on his way. Alviano, disregarding the new orders, continued the engagement; his army was eventually surrounded and destroyed. Pitigliano managed to avoid encountering Louis; but his mercenary troops, hearing of Alviano's defeat, had deserted in large numbers by the next morning, forcing him to retreat to Treviso with the remnants of the Venetian army. The Venetian collapse was complete. Louis proceeded to occupy Venetian territory as far east as Brescia without encountering any significant resistance; the Venetians lost all the territory that they had accumulated in northern Italy during the previous century. The major cities that had not been occupied by the French—Padua, Verona and Vicenza—were left undefended by Pitigliano's withdrawal, and quickly surrendered to Maximilian when Imperial emissaries arrived in the Veneto. Julius, having in the meantime issued an interdict against Venice that excommunicated every citizen of the Republic, invaded the Romagna and seized Ravenna with the assistance of Alfonso d'Este, Duke of Ferrara. D'Este, having joined the League and been appointed Gonfalonier on 19 April, seized the Polesine for himself. The newly arrived Imperial governors, however, quickly proved to be unpopular. In mid-July, the citizens of Padua, aided by detachments of Venetian cavalry under the command of the proveditor Andrea Gritti, revolted. The landsknechts garrisoning the city were too few in number to mount effective resistance, and Padua was restored to Venetian control on 17 July 1509. The success of the revolt finally pushed Maximilian into action. In early August, a massive Imperial army, accompanied by bodies of French and Spanish troops, set out from Trento into the Veneto. Because of a lack of horses, as well as general disorganization, Maximilian's forces would not reach Padua until September, giving Pitigliano the time to concentrate such troops as were still available to him in the city. The Siege of Padua began on 15 September 1509; although French and Imperial artillery successfully breached Padua's walls, the defenders managed to hold the city until Maximilian, growing impatient, lifted the siege on 30 September and withdrew to Tyrol with the main part of his army. In mid-November, Pitigliano returned to the offensive; Venetian troops easily defeated the remaining Imperial forces, capturing Vicenza, Este, Feltre and Belluno. Although a subsequent attack on Verona failed, Pitigliano destroyed a Papal army under Francesco II of Gonzaga in the process. The Battle of Polesella, a river attack on Ferrara by the Venetian galley fleet under Angelo Trevisan failed, however, when the Venetian ships anchored in the Po River were sunk by Ferrarese artillery. Francesco Guicciardini credited the decisive victory to Alfonso himself. A new French advance soon forced Pitigliano to withdraw to Padua once again. Faced with a shortage of both funds and men, the Senate decided to send an embassy to Julius in order to negotiate a settlement. The terms insisted on by the Pope were harsh: the Republic lost her traditional power to appoint clergy in her territory, as well as all jurisdiction over Papal subjects in Venice, the Romagnan cities that had prompted the war were to be returned to Julius, and reparations were to be paid to cover his expenses in capturing them. The Senate argued over the terms for two months, but finally accepted them on February 24, 1510. Even before the Venetian ambassadors had presented themselves to Julius for absolution, however, the Council of Ten had privately resolved that the terms had been accepted under duress and were therefore invalid, and that Venice should violate them at the earliest opportunity. This apparent reconciliation between Venice and the Pope did not stop the French from again invading the Veneto in March. Pitigliano's death in January had left Andrea Gritti in command of the Venetian forces; although Maximilian failed to reinforce Louis, the French army was nonetheless sufficient to drive the Venetians from Vicenza by May. Gritti garrisoned Padua for an expected attack by a combined Franco-Imperial army, but Louis, more concerned by the death of his advisor, the Cardinal d'Amboise, abandoned his plans for a siege. Julius, meanwhile, had become increasingly concerned by the growing French presence in Italy; more significantly, alienated from Alfonso d'Este by friction over a licence for a salt monopoly in the Papal states and Alfonso's continued forays against Venetian forces to secure his recently reacquired Polesine, he had formulated plans to seize the Duchy of Ferrara, a French ally, and to add its territory to the Papal States. His own forces being inadequate for the venture, the Pope hired an army of Swiss mercenaries, ordering them to attack the French in Milan; he also invited Venice to ally with him against Louis. The Republic, facing a renewed French onslaught, readily accepted the offer. 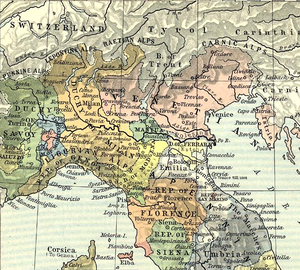 By July 1510, the new Veneto-Papal alliance was on the offensive. An initial attack on French-occupied Genoa failed, but Venetian troops under Lucio Malvezzo finally drove the French from Vicenza in early August; and a joint force commanded by Francesco Maria della Rovere, the Duke of Urbino, captured Modena on 17 August. Julius now excommunicated Alfonso d'Este, thus justifying an attack on the Duchy itself; in anticipation of his coming victory, the Pope traveled to Bologna, so as to be nearby when Ferrara was taken. The French army, however, had been left unopposed by the Swiss (who, having arrived in Lombardy, had been bribed into leaving by Louis) and was free to march south into the heart of Italy. In early October, Charles II d'Amboise advanced on Bologna, splitting the Papal forces; by 18 October, he was only a few miles from the city. Julius now realized that the Bolognese were openly hostile to the Papacy and would not offer any resistance to the French; left with only a detachment of Venetian cavalry, he resorted to excommunicating d'Amboise, who had in the meantime been convinced by the English ambassador to avoid attacking the person of the Pope and had thus withdrawn to Ferrara. In December, a newly assembled Papal army conquered Concordia and, in December, besieged the fortress of Mirandola; d'Amboise, marching to relieve the latter, fell ill and died, briefly leaving the French in disarray. Mirandola fell in January 1511, the pope having taken personal command of the assault; but d'Amboise had been replaced by Gian Giacomo Trivulzio, who took back Concordia and Castelfranco, while the Papal army retreated to Casalecchio. Alfonso d'Este, meanwhile, confronted and destroyed the Venetian forces on the Po River, leaving Bologna isolated once more. Julius, afraid of being trapped by the French, departed the city for Ravenna. Cardinal Francesco Alidosi, whom he left behind to command the defense of the city, was no better liked by the Bolognese than Julius himself had been; and when, on 23 May 1511, a French army commanded by Trivulzio arrived at the gates, they quickly surrendered. Julius blamed this defeat on the Duke of Urbino, who, finding this quite unfair, proceeded to murder Alidosi in full view of the Papal guard. By June 1511, most of the Romagna was in French hands; the Papal army, disorganized and underpaid, was in no condition to prevent Trivulzio from advancing on Ravenna. In response to this debacle, Julius proclaimed a Holy League against France. The new alliance rapidly grew to include not only Spain and the Holy Roman Empire (which abandoned any pretense of adhering to the League of Cambrai in hopes of seizing Navarre from Queen Catherine and Lombardy from Louis), but also Henry VIII of England who, having decided to use the occasion as an excuse to expand his holdings in northern France, concluded the Treaty of Westminster—a pledge of mutual aid against the French—with Ferdinand on 17 November 1511. In February 1512, Louis appointed his nephew, Gaston de Foix, to command the French forces in Italy. Foix proved more energetic than Amboise had been; having checked the advance of Ramón de Cardona's Spanish troops on Bologna, he returned to Lombardy to sack Brescia, which had rebelled against the French and garrisoned itself with Venetian troops. Aware that much of the French army would be diverted to deal with the impending English invasion, Foix and Alfonso d'Este besieged Ravenna, the last Papal stronghold in the Romagna, in hopes of forcing the Holy League into a decisive engagement. Cardona marched to relieve the city in early April, and was decisively beaten in the resulting Battle of Ravenna, fought on Easter Sunday; the death of Foix during the fighting, however, left the French under the command of Jacques de la Palice, who, unwilling to continue the campaign without direct orders from Louis, contented himself with thoroughly sacking Ravenna. By May 1512, the French position had deteriorated considerably. Julius had hired another army of Swiss mercenaries; they descended on Milan, bringing with them Maximilian Sforza, who was determined to regain control of the Duchy for his family. The French garrisons abandoned the Romagna (where the Duke of Urbino quickly captured Bologna and Parma) and retreated to Lombardy, attempting to intercept the invasion. By August, the Swiss had combined with the Venetian army and forced Trivulzio out of Milan, allowing Sforza to be proclaimed Duke with their support; La Palice was then forced to withdraw across the Alps. In late August, the members of the League met at Mantua to discuss the situation in Italy (particularly the partition of territory acquired from the French). They quickly came to an agreement regarding Florence, which had angered Julius by allowing Louis to convene the Council of Pisa in its territory. At the Pope's request, Ramon de Cardona marched into Tuscany, smashed Florentine resistance, overthrew the Republic and installed Giuliano de' Medici as ruler of the city. On the subject of territory, however, fundamental disagreements quickly arose. Julius and the Venetians insisted that Maximilian Sforza be permitted to keep the Duchy of Milan; Emperor Maximilian and Ferdinand conspired instead to have one of their cousins installed as duke. The Pope demanded the immediate annexation of Ferrara to the Papal States; Ferdinand objected to this arrangement, desiring the existence of an independent Ferrara to counter growing Papal power. Most problematic, however, was the attitude of Maximilian towards Venice. The Emperor refused to surrender any Imperial territory, which in his eyes included most of the Veneto, to the Republic; to this end, he signed an agreement with the Pope to exclude Venice entirely from the final partition. When the Republic objected, Julius threatened to reform the League of Cambrai against her. In response, Venice turned to Louis; on 23 March 1513, a treaty pledging to divide all of northern Italy between France and the Republic was signed at Blois. In late May 1513, a French army commanded by Louis de la Trémoille crossed the Alps and advanced on Milan; at the same time, Bartolomeo d'Alviano and the Venetian army marched west from Padua. The unpopularity of Maximilian Sforza, who was seen by the Milanese as a puppet of his Swiss mercenaries, enabled the French to move through Lombardy with little resistance; Trémoille, having seized Milan, besieged the remaining Swiss in Novara. On 6 June, the French were attacked by a Swiss relief army at the Battle of Novara, and were routed despite having superior numbers. Detachments of the Swiss army pursued the fleeing French over the Alps and had reached Dijon before being bribed into withdrawing. The rout at Novara inaugurated a period of continuous defeats for the French alliance. English troops under Henry VIII besieged Thérouanne, defeated La Palice at the Battle of the Spurs, and captured Tournai. In Navarre, resistance to Ferdinand's invasion collapsed; he rapidly consolidated his hold over the entire region and moved to support another English offensive in the Guyenne. James IV of Scotland invaded England at the behest of Louis; but he failed to draw Henry's attention from France, and his death—and the Scots' catastrophic defeat—at the Battle of Flodden on 9 September 1513, ended Scotland's brief involvement in the war. Meanwhile, Alviano, unexpectedly left without French support, retreated into the Veneto, pursued closely by the Spanish army under Cardona. While the Spanish were unable to capture Padua in the face of determined Venetian resistance, they penetrated deep into Venetian territory and by late September were in sight of Venice itself. Cardona attempted a bombardment of the city that proved largely ineffective; then, having no boats with which to cross the lagoon, turned back for Lombardy. Alviano, having been reinforced by hundreds of volunteers from the Venetian nobility, pursued Cardona and confronted him outside Vicenza on 7 October. In the resulting Battle of La Motta, the Venetian army was decisively defeated, with many prominent noblemen cut down outside the city walls as they attempted to flee. However, the Holy League failed to follow up on these victories. Cardona and Alviano continued to skirmish in the Friuli for the rest of 1513 and through 1514, fighting several inconclusive battles, but Cardona was unable to make any real progress. Henry VIII, having failed to gain any significant territory, concluded a separate peace with France. Finally, the death of Julius left the League without a leader; Julius' successor to the Papacy, Leo X, was rather less concerned with military matters. The death of Louis XII on 1 January 1515 brought Francis I to the throne. Having assumed the title of Duke of Milan at his coronation, Francis immediately moved to reclaim his holdings in Italy. By July, Francis had assembled an army in the Dauphiné. A combined Swiss and Papal force moved north from Milan to block the Alpine passes against him, but Francis, following the advice of Gian Giacomo Trivulzio, avoided the main passes and marched instead through the valley of the Stura. The French vanguard surprised the Milanese cavalry at Villafranca, capturing Prospero Colonna; meanwhile, Francis and the main body of the French confronted the Swiss at the Battle of Marignano on 13 September. The Swiss advance initially made headway; however, Francis's superiority in cavalry and artillery, together with the timely arrival of Alviano (who had successfully avoided Cardona's army at Verona) on the morning of 14 September, led to a strategically decisive victory for Francis and the Venetians. After the defeat at Marignano, the League no longer possessed the ability or the will to continue the war. Francis advanced on Milan, capturing the city on 4 October and removing Sforza from the throne. In December, he met with Leo at Bologna; the pope, who had in the meantime been deserted by the remainder of his Swiss mercenaries, surrendered Parma and Piacenza to Francis and Modena to the Duke of Ferrara. In return, Leo received guarantees of French noninterference in his proposed attack on the Duchy of Urbino. Finally, the Treaty of Noyon, signed by Francis and Charles V in August 1516, recognized French claims to Milan and Spanish claims to Naples, removing Spain from the war. Maximilian held out, making another attempt to invade Lombardy; his army failed to reach Milan before turning back, and by December 1516, he had entered into negotiations with Francis. The resulting Treaty of Brussels not only accepted French occupation of Milan, but also confirmed Venetian claims to the remainder of the Imperial possessions in Lombardy (except for Cremona), effectively ending the war with a return to the status quo of 1508. The peace, however, would last only four years; the election of Charles V as Holy Roman Emperor in 1519 caused Francis, who had desired the position for himself, to begin the Italian War of 1521–26. The Italian Wars, thus reignited, would then continue until 1530 without significant interruption. ^ The conflict comprising the 1508–1516 portion of the Italian Wars may be divided into three separate wars: the War of the League of Cambrai (1508–1510), the War of the Holy League (1510–1514), and Francis I's First Italian War (1515–1516). The War of the Holy League may be further divided into the Ferrarese War (1510), the War of the Holy League proper (1511–1514), an Anglo-Scottish War (1513) and an Anglo-French War (1513–1514). Certain historians (notably Phillips and Axelrod) refer to each of the component wars separately, while others (notably Norwich) treat the entire conflict as a single war. ^ Mallett and Shaw, The Italian Wars, 56–57. ^ Norwich, History of Venice, 390. ^ Guicciardini, History of Italy, 168–175. ^ Norwich, History of Venice, 391. ^ Shaw, Julius II, 127–132, 135–139. ^ Mallett and Shaw, The Italian Wars, 85. ^ Norwich, History of Venice, 392. ^ Guicciardini, History of Italy, 189–190. ^ Norwich, History of Venice, 393. ^ Taylor, Art of War in Italy, 119. ^ Norwich, History of Venice, 399–400. ^ Mallett and Shaw, The Italian Wars, 90. ^ Norwich, History of Venice, 401–402. ^ Mallett and Shaw, The Italian Wars, 94. ^ Norwich, History of Venice, 404. ^ Norwich, History of Venice, 405. ^ Norwich, History of Venice, 406. ^ Guicciardini, Storia d'Italia, 806–812. ^ Norwich, History of Venice, 408–409. ^ Norwich, History of Venice, 410–411. ^ Rowland, "A summer outing in 1510". ^ Norwich, History of Venice, 415. ^ Norwich, History of Venice, 417. ^ Guicciardini, History of Italy, 216. ^ Guicciardini, History of Italy, 227. ^ Hutchinson, Young Henry: The Rise of Henry VIII, 159. ^ Guicciardini, History of Italy, 244. ^ Norwich, History of Venice, 422. ^ Norwich, History of Venice, 423–424; Oman, Art of War, 152. ^ Norwich, History of Venice, 425. ^ Oman, Art of War, 153–154; Taylor, Art of War in Italy, 123. ^ Goubert, Course of French History, 135. ^ Norwich, History of Venice, 429. ^ Guicciardini, History of Italy, 282. ^ Norwich, History of Venice, 430. ^ Taylor, Art of War in Italy, 67. ^ Norwich, History of Venice, 431. ^ Guicciardini, History of Italy, 290. ^ Norwich, History of Venice, 432. Goubert, Pierre. The Course of French History. Translated by Maarten Ultee. New York: Franklin Watts, 1988. ISBN 0-531-15054-2. Guicciardini, Francesco. Storia d'Italia. Edited by Silvana Seidel Menchi. Volume II. Turin: Einaudi, 1971. Hutchinson, Robert. Young Henry: The Rise of Henry VIII. New York: Thomas Dunne Books, 2012. ISBN 978-1-250-01274-6. Kamen, Henry. Empire: How Spain Became a World Power, 1492–1763. New York: HarperCollins, 2003. ISBN 0-06-019476-6. Montgomery, Bernard Law. A History of Warfare. New York: World Publishing Company, 1968. ISBN 0-688-01645-6. Shaw, Christine. Julius II: The Warrior Pope. Oxford: Blackwell Publishers, 1993. ISBN 0-631-16738-2.